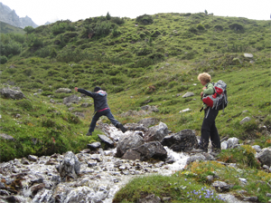 Tirol – Tour Guide Mark – Let's Go Exploring! 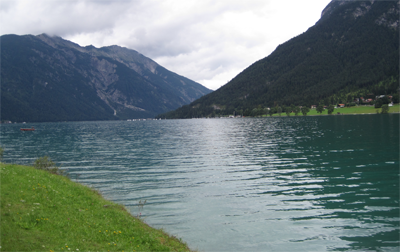 The Lüsenstal, a valley in Tirol, Austria, is one of the most majestic places I have ever beheld. For comparison, it is as elegant as two locations in America’s National Parks: the inspiring Yosemite Valley and the grand Kings Canyon. The ride into the valley treated everyone in the car to vistas of mountains wrapped in green forests, streams that danced downhill and the occasional cow that munched on the abundant green grass. The Lüsenstal is a great depression in the earth; like a child at the beach who scoops out a long channel of sand with her hand the Lüsenstal has a similar pattern, but on an immense scale like a great hand has dug into the Alps and pulled back the terrain creating a u-shaped channel that rises nearly a thousand meters on either side. One feels small in this place, yet part of something more. We arrived at a farm and guest house located on the valley floor and parked the car. We looked around a few minutes and were awed by the scale of the valley. Several kilometers away, at the ‘back’ of the valley, the flat land ends and becomes almost perpendicular, climbing hundreds of meters high. At the lip of this wall, the rock appears to be slick with water. Looking through binoculars you can see channels of water emerging from the bright white surface at the very edge of the mountain. This is a glacier. 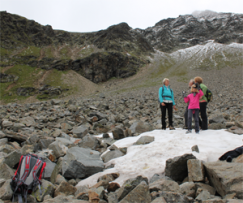 The local Tirolean on our hike remarked that when she was a girl the glacier ice was visible a quarter of the way down the mountain. Several interpretive displays (written in German and English) along with a section of the trailing document the retreat of the glacier over the past century. Our hike was steep but relaxing. We crossed streams, past open fields and woodlands. Wild blueberries grew along the trail and we ate our fill. At the top of a distant mountain, I saw microscopic dots of snow that appeared to be moving! I looked closer, the dots jumped and moved in all directions along the edge. These tiny dots were actually sheep. 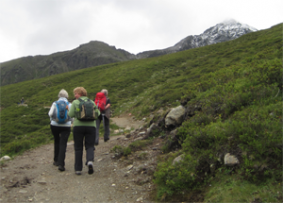 The trail meandered into the Lüsenstal and gently curved up a side valley allowing us glorious views of the valley below and we could see a little more of the glacier in the distance. More dots moved slowly on the valley floor, the more colorful dots were people and the slighter larger brown dots were grazing cows. 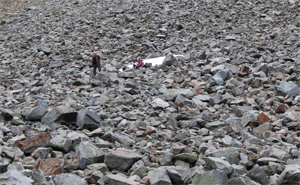 The view into the side valley was a jumble of boulders and stones. No trees grew in this place. The trail snaked jaggedly among the boulders and along the hillside to a building in the distance. This was another all, it did not look far, but it was still an hour or more away. Instead, we meandered along the trail to a stream and crossed several footbridges. Just beyond was a seasonal cabin. A gang of yearling cows stood nearby and deemed it important to search any and all hikers who passed. One cow was especially gentle and let us scratch behind her ears and pet her soft fur. This cow liked to lick people, hands, and backpacks. The cow followed us to the cabin. Outside the cabin was a family of German hikers eating lunch. The cow took an immediate interest. A woman in the group thought the cow joining their picnic was great fun until the yearling, with bullet-like speed, stepped into the middle of their food and licked her sandwich. The woman squawked at the intrusion. The cow licked again. This time a man in the group clapped his hands and pushed the cow back a short way. The cow’s tongue, like an uncoiling rope, now reached for the morsel, but it was not able to reach the sandwich a third time. By now two others had joined the man and the invading cow was pushed out of the picnic. It was great entertainment to see. We walked down the rough mountainside and into the trees again. The sun now illuminated the opposite of the valley and I was astounded to see a great waterfall tumbling forth. It was hidden from view in the shade. It was still several kilometers away. Stepping off the steep mountain and onto the green flat land of the valley I could appreciate just how deep the valley was and how high the glacier was above me. If I was the size of an ant looking up at a house, the edge of the glacier would be at the roof line. We found a good spot to rest in an open field, next to a stream and enjoyed our sandwiches. We even soaked our feet in the stream, but only for a minute for the water was not just mountain water, it was glacial meltwater – and frigid! 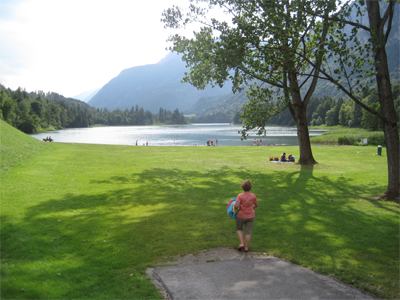 Afterward, we walked quietly back to the car and enjoyed the complex simplicity of the valley. We even spied another tall waterfall in the distance. 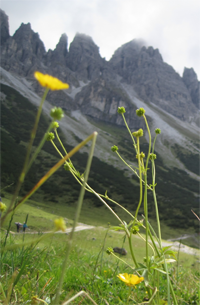 The valley was intensely beautiful and worthy of our last day – on this trip – to Tirol. But, this a great place to explore, I will be back. 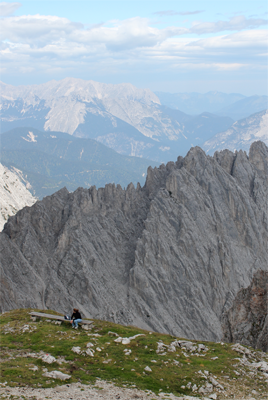 Any visitor to Innsbruck, Austria, will notice the Bergisel, a high and rounded hill at the southern end of the city. On the hill are several great places to visit. 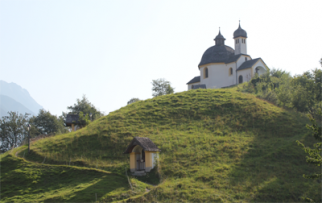 Two are listed here, the first is “Das Tirol Panorama.” This is a new and architecturally beautiful museum that highlights an important battle that occurred on the hill and defined Tirol. In 1809 Bavarian troops, allies of Napoleon, marched into the Inn Valley to assert control over the land. 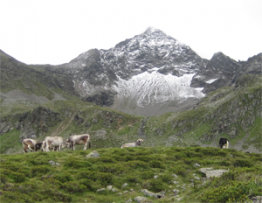 The Tiroleans –led by a local folk hero Andreas Hofer – rallied to protect their homes and their independence. 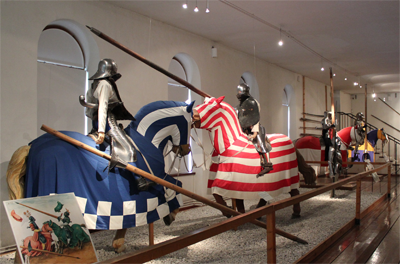 The most famous battle was the Third Battle of the Bergisel in which the Tiroleans fought off the invaders. 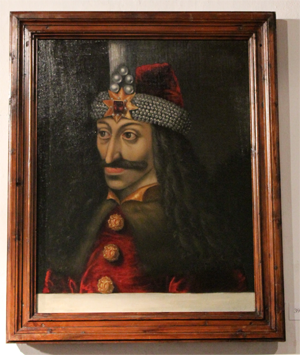 The battle was memorialized in a giant panoramic painting that is 1,000 square meters (10,764 square feet) in area. Today, this huge and historic 360-degree painting is accentuated with bullet shredded trees, cannons, and war-torn land, giving the viewer the perspective of being in the battle. 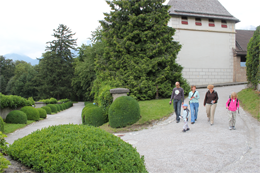 Outside the museum is a life-sized statue of Andreas Hofer along with several monuments of Emperors of Austria. 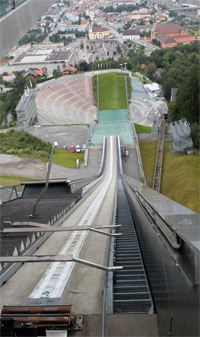 Up the hill is the entrance to the Bergisel Ski Jump and Stadium. 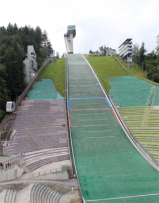 The ski jump rises 250m (820 ft) over Innsbruck. It is a sleek and modern structure with a steep track that pours down from the tower and launches over an extremely large open space – a deep depression – carved into the hillside for viewers. This bowl-shaped viewing area can accommodate 28,000 standing visitors! 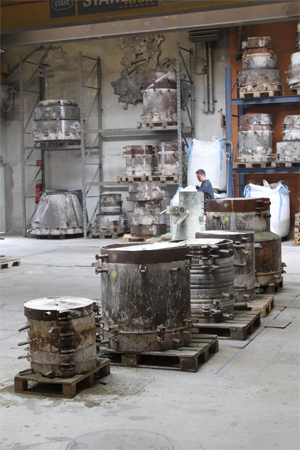 At the opposite end of the jump are the cauldrons of the Olympic flame that were used in 1964 and 1976. As I entered the Stadium a swoosh was heard. A man had just launched from the edge of the jump and ‘flew’ with grace for several seconds until his skis made contact with the steep artificial ground, in several additional seconds he had stopped and left the field. Everyone watched the jumpers for some time with their practice runs. It was very impressive to see. I climbed a good number of steps to the base of the tower (yes, there is a lift that will take you from the base of the stadium to the tower). An elevator inside took me and several visitors 50 meters to the top to a restaurant and a viewing platform. 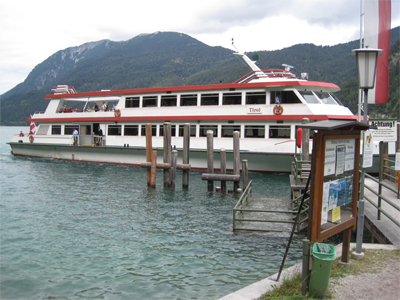 Visitors can get to the Tirol Panorama and the Bergisel Stadium by bus or on foot. Regardless of how you arrive, wear comfortable shoes. 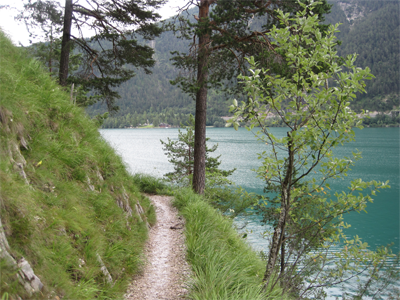 A lifelong resident of Innsbruck, Austria, recommended the Zirbenweg Trail for a pleasant and active day hike. The morning started in Innsbruck. 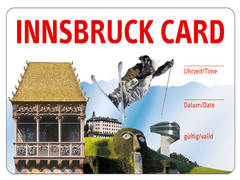 My wife and I caught a bus that quickly shuttled us to the nearby town of Igls, where we walked a few minutes up a hill to the Patscherkofel Talstation (valley station) and purchased the aerial cable car tickets, which included our tickets on a lift down the mountain and a bus ride back to Innsbruck. Fifteen people boarded a colorfully painted and well used looking cable car. The attendant asked us to stand back as he closed the door. The door failed to latch so he returned with a large wrench and gave the latch a solid whap, the door locked. He looked at us with a sly smile. 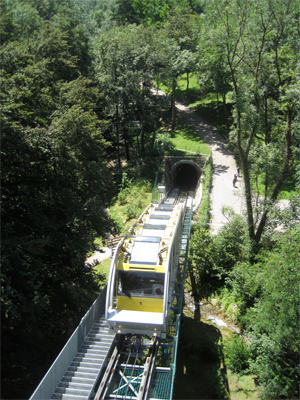 The tram started to rise and glide over the treetops and up the mountain. We were treated to a birds-eye view of trails, fields, woods and of the serpentine curves of Innsbruck’s Olympic Bobsled run. Twenty minutes later, and one kilometer higher in elevation, we arrived at the Bergstation (mountain station) and enjoyed a gorgeous view of the valley below. The temperature was a chilly 6 degrees C (43F). The Zirbenweg Trail was well marked with signs. 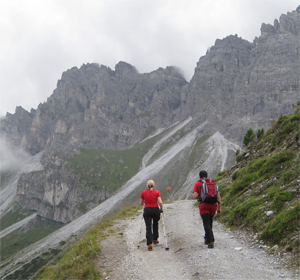 The hike would take just about 3 hours and follow an elevation of approximately 2000m (6000 feet). 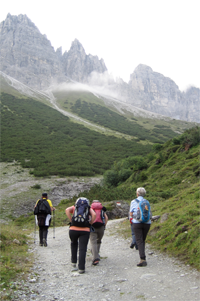 This popular trail offered a visual bounty; our eyes were always being fed with intoxicating Alpine scenery or pleasant vistas of the Inn Valley below. After about an hour of hiking, we saw several red and white banners appearing over a small hill. 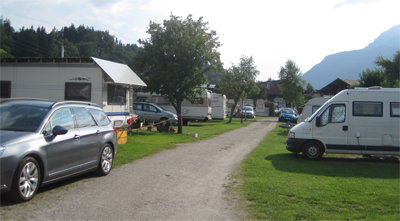 These marked the quaint Boscheben Alm. The wind was beginning to blow strongly and the sky was darkening with clouds. We questioned the intent of the weather and thought it best to observe it for a little while longer. The Alm provided shelter, and after looking at the menu, we thought it prudent to supply our bellies with a warm meal. Inside the Alm were walls and tables made of heavy wood. 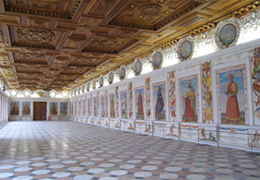 Decorating the walls were pelts of animals that had supposedly been collected from the mountain: there were foxes, marmots, birds, and a giant wild swine that in the U.S. we would call a Razorback. The soup of the day was a Knödelsuppe. We ordered one bowl between us; ten minutes later a bowl was delivered with a large knödel – a baseball-sized orb made with dried bread, milk, eggs, speck (smoked meat), onions, parsley, flour and salt that had been boiled in beef broth – that sat like an island in a sea of it’s own broth. It was delicious. Afterward, we looked outside, the weather was less intimidating so we continued on the hike. 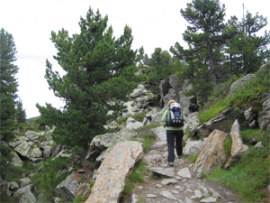 The trail was densely forested in this area but was quickly replaced with giant boulders and jagged rocks. As the trail curved we were greeted face-to-face with three Brown Swiss cows. They had kind faces and did not seem to mind our company. Their fur was some of the softest I had ever touched and we took several photos with them. One cow appeared to have stepped in a hole and had a skinned knee. The injury did not appear to be life-threatening but it must have hurt. As we left, a family rounded the corner on the trail, and the cows enjoyed a repeat of human affection. The trail crossed several streams and passed a number of interpretive signs that further introduced the hiker to the natural features along the trail. The most curious, or pleasant, items were some ‘reflection’ benches that had been placed on the trail for the enjoyment of hikers. Each reflection bench was placed along the trail at a most enjoyable vista. Now, we could see several buildings in the distance, they appeared like dots. A stream briefly blocked our path but a well placed wooden plank allowed us safe passage. The clouds overhead had been disappearing and the sunny, blue sky was now unimpeded, making for an absolutely gorgeous day. One of the reflection benches sat in front of a great boulder. As I sat down I noticed that embedded in the stone was a marker dedicated to the man who helped create this trail. 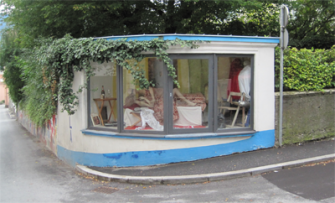 A newly built and modern building was close by, this was a small chapel. Several hikers, older men with gray beards, were sitting near the front door and enjoying the vista of the green cultivated valley far below. 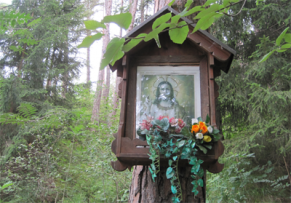 They were sitting in a human-made chapel within a larger natural chapel of mountains and valleys. We nodded at each other from a distance as we passed. The next building, the Tulfeinalm, was still a good twenty minutes walk away. We crossed another stream that poured and danced down the steep mountain that blocked our path. Several cows watched us pass the area. The Tulfeinalm provided another opportunity to replenish our stomachs. The waiter plunked down a tall half liter of golden wheat beer and a desert in front of us; he informed us that if we did not clean our plates it would be such a disappointment to the cook that she would be emotionally devastated and not want to cook again. We did not disappoint the cook and finished our meals. Our return trip down the hill was via a ski lift, though when I saw this bouncy single-chair lift, I questioned the logic of this route. An attendant directed me to place my shoes on some painted feet outlines that were on the pavement. I moved my backpack to my front and turned my head – a levitating chair moving rapidly in my direction. The chair quickly arrived – and I sat – making firm contact on the seat but the floating chair was not stable, it bounced and rocked as I wrestled with an arm handle – to turn, rotate and turn back the contraption which then allowed a footrest to appear by my feet. I rested my feet and the chair steadied. For the next 20 minutes, I was floating thirty feet above the ground enjoying million dollar views. Near the end of the ride, the cable stopped moving. Silence. My chair was suspended in mid-air. The sounds of the mountain started to be heard: a cowbell in the trees below, a bird chirping, with the wind gently whooshing through the branches of the trees. The view of the valley below – one immense and a grand display of nature of mountains, sunlight, snow, forests, streams, and rivers. Those four minutes were some of the most pleasant moments of my day. The lift station arrived, or rather I arrived at the lift station and jumped off my chair. I watched it for a minute make the return journey up the hill, I really wanted to return with it. A second lift, this time a two-seater was close by and would take us down the remaining half of the mountain. 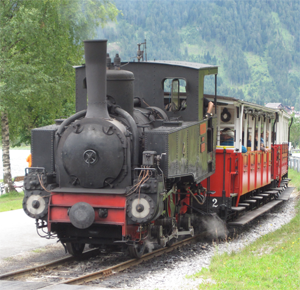 My wife and I took this lift and in 15 or so minutes arrived in the village of Tulfes. We had only a minute to make the bus stop or have to wait an hour – which would have been pleasant for we were in a lovely village, but we had promised to return by an early time. We ran like youthful deer to make our bus connection and did – just barely. 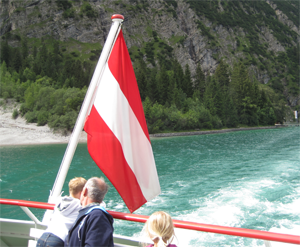 The thirty-minute ride back to Innsbruck was pleasant. We passed through several villages, past farms, and fields of corn and wheat. Our hike had taken about 7 hours with the tram rides, eating, enjoying the views and petting cows. What a fantastic day. 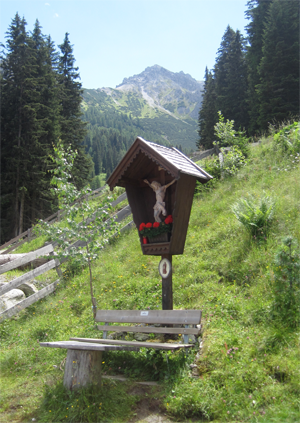 The scenery on the drive to the mountain village of Kühtai, located in the Tirolean Alps, was splendidly delicious. 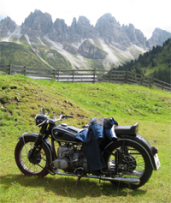 The town was located less than an hour’s drive from Innsbruck but passed all manner of natural delights: mountains helmeted with snow, cascading streams of water, thick carpets of forests and open expanses of glacial carved valleys. Tan colored cows were commonly seen walking on the roads and signs warning drivers of their presence were common. Our goal that warm summer day was to locate and touch snow. The village was basically closed when we arrived. It was a winter ski town and sat snuggly within a mountain pass, far above the trees. 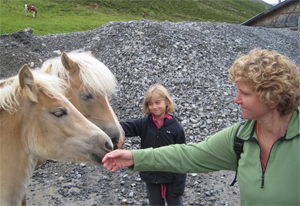 The empty town had a number of buildings but it was not uninhabited; two good-looking blondes approached our group, horses, of course, a mare and a yearling greeted us. They were soft to the touch and were curious about our backpacks. At that moment a tourist bus drove past. Everyone inside looked longingly as we pet the horses and they nuzzled our hands in return, but the bus did not stop, it just continued down the road. We started the hike. The unseen trail was at a 45-degree angle and hard to navigate. Fortunately, we located the real trail and the ascent was lessened but we still gained elevation. For some time we walked on this thin ribbon of trail that spiraled around the side of the mountain. 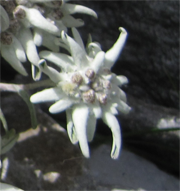 The terrain was barren, only small plants and grasses grew at this elevation above the tree line. 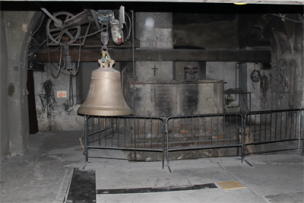 The metallic clank of bells informed us that cows were just ahead – one was very friendly. As we walked out of an indented section of the trail we came to an open area where we could see a great distance, a number of cows and horses were grazing. 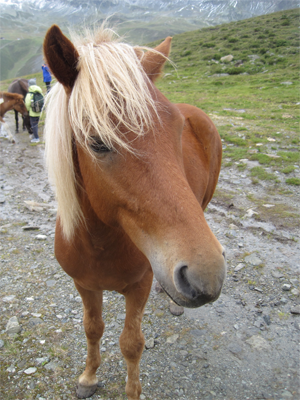 A guard horse stood at attention and watched us closely, the wind blowing wild streams of blond and tan colored hair across his face. In this open area, when the wind was just right, we could hear bells from several kilometers away being worn by cows on the opposite side of the great valley. Gentle trickles of water rippled down the mountainside offering opportunities to hop and skip over streams, rocks and sometimes slip to find a quagmire of mud. The wind was cool on the mountain, we placed warm knitted hats over our ears to protect us from the nippy chill. A lake appeared before us. It was difficult to see from afar as its mirrored surface reflected all that shown upon it – it was a perfect camouflage, that is until the stillness was disturbed by a thrown stone. Then, as the rolling ripples raced away from the disturbance, in perfect circles, the colors and tones of blues and greens revealed themselves. The lake revealed that it hid some deep water. The trail grew steep again. Several cows watched us from nearby. One even let us pet it – it was surprisingly soft. Ahead of us was lettering etched on the side of the mountain, they were large capitals, possibly as large as a man is tall, the letters spelled M-E-I-N. In English, this translates to ‘mine.’ Such a statement gave a person pause to contemplate the meaning. Our small troop was still well below the snow line and there was concern that maybe our hopes to touch snow would be dashed. We crested a rise in the trail. A stream with a respectable flow of water was disgorging itself from the ground. Beyond lay a marshy area, more appropriately the ‘ground’ was mossy, spongy and acted like a trampoline as we walked, astronaut-like, across this green moonscape. A hole, about the size of a large grapefruit, was in the ground near some rocks – there were tracks around it. This was a Marmot’s home. A Marmot is a furry creature that looks like a giant Guinea Pig – but tougher, more independent…rugged. Just beyond lay another hole, possibly several Marmots lived here, but more likely this was just a back entrance. The spongy area now turned to grass, but it was littered with the candy-sized droppings from mountain sheep. We skipped on rocks to avoid the abundant sweetness on the ground. With our eyes patrolling where we stepped none noticed the rubble field that lay before us. We stood at the base of a great alluvial fan of shattered, shocked and shards of granite that had fallen from the face of the mountain. The source of this stone projected itself skyward into the blue many hundred of meters. 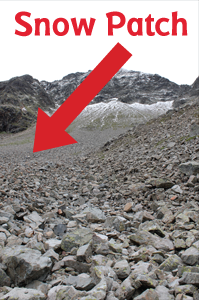 Part way across this expanse of gray rubble and dark boulders were two tiny dots of white snow. We carefully hop-scotched and danced across stones; some as voluminous as autos, others the size of a phone book. After fifteen minutes of trudging the white dots were now the size of a small room. We had found the snow! Those who arrived at the snow ahead of us slower, more careful and diligent hikers, took inventory of their resources and seeing an abundant supply of not just snow, but icy-cold-slushy snow, decided to pelt their comrades. The Snowballs rained down! The icy artillery slammed into the rocks with a ‘splud’ releasing spray and ice. Most of the snowballs were tossed in amusement and humor, but on occasion, I felt the sting of a good joke as the spray from a snowball made contact – or worse found an opening in my jacket and felt like frigid fingernails down the back of my shirt! Finally, everyone arrived at the island of snow in this ocean of stone. 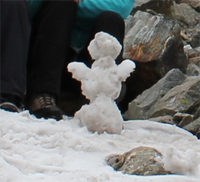 We built a small “Schneemann” (snowman). We devoured our small lunches and contemplated the beauty around us, though my thoughts kept returning to my lunch, rather the lack of it, and that next time I would pack edible provisions with significantly greater mass. An arctic type chill descended on the valley. The vagrant white clouds that had lazily wafted overhead all day had quickly gathered into a sizable gray mob on the horizon. The Grandpa in the group informed us to pack up, it was time to leave the mountain. We departed the snow patch, over the jagged stones and through the spongy marsh area, and over the mountainside but on a downward path. We passed another lake. It was beautiful but oddly warm to the touch – it lacked the expected chill. A large boulder in the lake appeared to rise from the temperate still waters. It started to rain. We donned our rain gear and continued down the mountain. After twenty minutes the rain let up and the sun briefly illuminated the valley. After a few additional minutes the warm sun was replaced with overcast clouds. Ahead of us was a herd of horses that was very pleasing to the sight. They were tan, muscular, healthy and dined on an abundance of the green mountain grass. The buildings of the village now appeared before us, but in miniature, like toys in a child’s room. In our bid to escape the horse-piranhas we had lost the trail, and instead invented our own, which was now 45 degrees in decent. We moved down a small crease in the side of the mountain, occasionally scaring up a frog. Some of the frogs were of good proportion and we joked that we were always seeing the same frog who was trying to escape us. 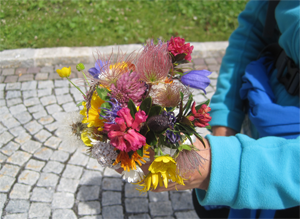 My daughter collected wildflowers on the way and made a beautiful bouquet. Back in the village, it was quiet. We looked for a place to grab a coffee and relax, but none was to be found in this Alpine ghost town of modern buildings. A chilled wind blew around us so we gave up on coffee and headed back to the car. At the vehicle, everyone gladly unleashed their barking feet from the restraints of the hiking boots. We then slid our feet into squishy, roomy and comfortable sandals. Our feet were sore, our knees ached, our faces were slightly windburned, we had too much sun, we were thirsty, hungry and tired. But, it was a good tired! 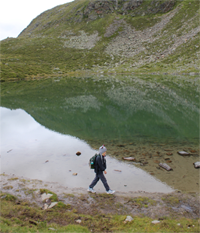 Everyone had a fun, eventful and meaningful day being outside, with good company in these beautiful Alpine mountains. I breathed in a deep breath of cool mountain air and held it in my lungs, savoring the ‘deliciousness’ and not wanting to breath out. Another tour bus blared past. Eager faces were pressed near the tinted glass, they appeared to be anxious and wanting of an active experience. If you stand anywhere in Innsbruck, Austria, you will notice an imposing mountain range rising 2454m (8051 feet) over this beautiful city. 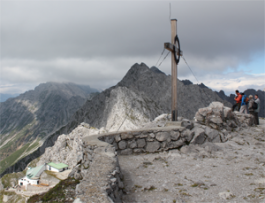 This is the Nordkette (Northern Chain) – an immense wall of granite with numerous peaks and trails to explore. 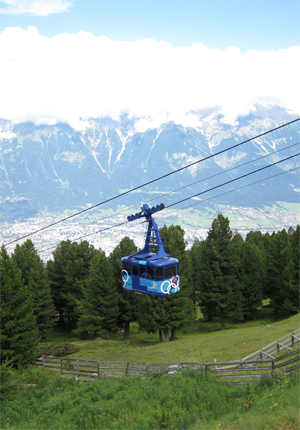 Visitors can easily visit via the Nordkettenbahn (gondola) which whisks people up the mountain in 20 minutes. 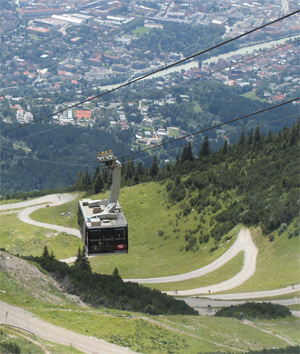 Starting near downtown Innsbruck (560m, 1837 feet), visitors can take the fast and modern Hungerburgbahn and in ten minutes be within a few steps to the Nordkettenbahn (gondola). 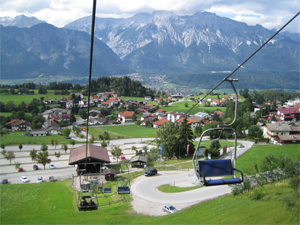 The Nordkettenbahn (gondola) glides over rooftops and farms, hiking and biking trails that quickly reveal themselves hidden among the trees. The sun that day was bright and the clean air allowed for endless vistas as the gondola ascended ever higher. After 15 minutes we stopped at a solid rock building known as the Seegrube. 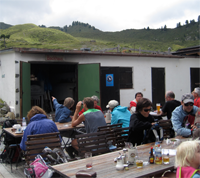 The Seegrube station is located at 1905m (6350 feet) and offers a restaurant and areas outside for play and exploration. It is a joy to walk down the mountainside from this location, but that is another story. 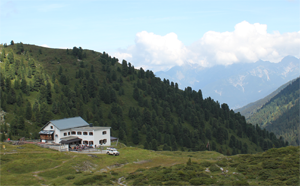 In the summertime musical events are held outside Seegrube and people often bring tents and camp out on the side of the mountain. The terrain here is rocky and barren looking, but quite beautiful. As people disembarked from the gondola a nippy temperature embraced everyone. People quickly began putting on warm hats and an extra jacket. We walked a few paces inside the building to the second leg of the gondola ride. 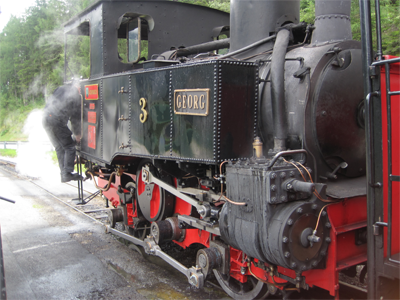 A small cable-car glided into the station; this was the more petite-sized Hafelekar station bound gondola. In a few minutes our gondola-pod, holding maybe 10 or 12 people, rose over the shattered and rough looking stones below. We climbed, at a very steep ascent of 40-45 degree angle up the mountain. Upon the barren rock face were large metallic structures, fences designed to hold great weight and guard the city below against avalanches. As we approached the Hafelekar our gondola slowed to a crawl. At that moment a powerful wind gush pushed the car to one side and people in the pod briefly lost their footing. As the pod swung back the operator increased the speed and the pod – with a hard bump and then a dull thud – arrived safely at Hafelekar, elevation 2256m (7729 feet). The landscape here was naked, only grass and lichens were visible on a barren landscape of jagged stone. The air was cold – around 6 degrees C (42F) and made colder by the fierce wind that boxed our ears and made our eyes tear. Several tourists wearing only shorts, a t-shirt and a camera bolted quickly up the mountain for photos. After ten minutes they vigorously returned and clamored into the warmth of the station. 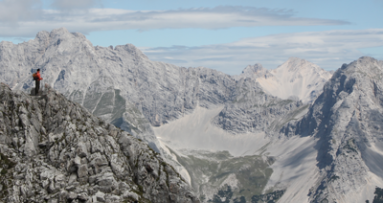 Reaching the actual top of the mountain requires 15 minutes walk up a steep and rocky path to the summit of Hafelekarspitze. This small trail was well worn during the years of visitation. The top of the mountain has a small protective rock wall for visitors, near this area sits a large cross. From the mountaintop, you can see miles beyond in every direction. 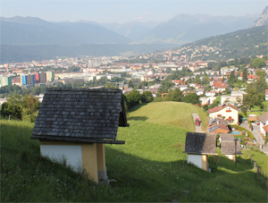 Below, Innsbruck appeared like a miniature toy city, with tiny buildings and small train yard. The mighty Inn River was just a appeared to be a gentle ribbon of water. Standing on top of the mountain the setting was peaceful; a bit windy, but the sun was shining, a blue sky was overhead, and the dramatically sculpted mountains surrounding us looked peaceful, but that was about to change. While exploring some side trails the wind grew very fierce and some menacingly gray clouds appeared to spontaneously generate overhead. 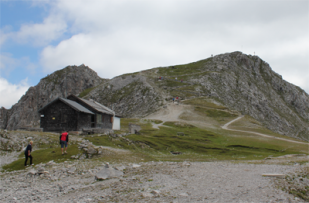 We quickly removed ourselves from the mountain via the gondola and shortly we stood again in Innsbruck. We peered up the great line of mountains, the area near the top – where we were – was blanketed by dark clouds and was hidden from view. An hour afterward, these clouds had silently marched down the mountainside and were bathing Innsbruck in a cool rain. Innsbruck has a number of colorful neighborhoods, one of the more curious is Hötting. 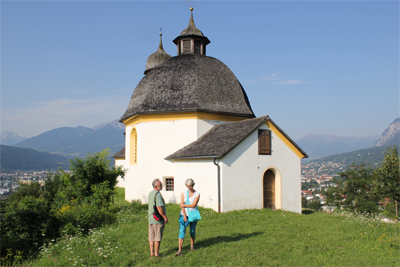 Hötting is located in the northwestern part of Innsbruck, just a short walk from the touristy and historic Altstadt area. Immediately crossing into Hötting it is noticeable the crowds have thinned and the pace of life is slower and more relaxed. 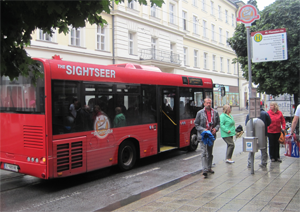 The main street, Höttinger Gasse, is quiet except for the occasional auto that whizzes past. Walking up the gradient of the street sharply increases but it is not uncomfortable, possibly this detracts most tourists from venturing to this area. The streets are very narrow here and suggest this is a very old section of town. 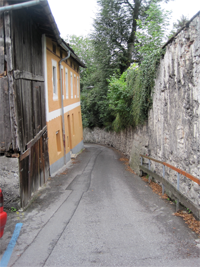 According to the Stadtarchiv Museum (City Archives), this is actually one of the oldest sections of Innsbruck. The streams here were once used as a water source for the city. A short way up the street are signs of artistic graffiti on a long wall. 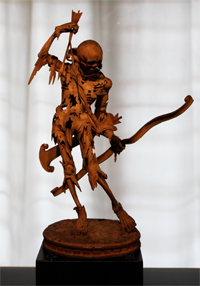 Some of the images, artwork, and designs have humorous slants. One image mixed in with the tangle of colors is a life-sized painting of the animated character Homer Simpson, of course, he is thinking of beer as shown by several thought bubbles. At the end of the wall is a curious visual display; several large plate glass windows – like those of a shop – offer a glimpse into a bedroom. In the bedroom are two mannequins with a variety of arms and legs sprawling in every direction; in the midst of this revelry, the mannequins gaze at each other with unemotional expressions. The scene is cause for a double-take among passing pedestrians. Another area along the street, in a recessed area, is a stenciled picture of a former US President wearing an elfin-looking holiday stocking on his head with the words, “Happy X-mas USA.” A small business selling drums and didgeridoos is nearby. Another small business has a sign offering eastern meditation and martial arts classes. 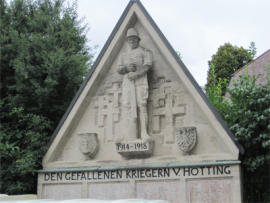 Continuing up the street is a very curious memorial; it is from World War I and dated “1914-1918” and the words, (translated to) “The Fallen in War from Hötting.” The marker features several carved crosses and a man – a soldier, his head down, his hands resting on and over the barrel of his rifle, his expression austere. However, approaching the monument his expression changes, he now appears sad, somber and mournful. He stands over a number of names of soldiers from World War I – those who never returned. The second set of names appears below the first grouping; these names appear on a memorial that was never intended for them, these are names from World War II. Further up the street is a church, the “Alte Höttinger Pfarrkirche” (Old Hötting Church). This church is quite old and has some refurbishment work that is under construction. Nearby is a simple graveyard, a peaceful and colorful place with various dates on the markers along with photos and flowers for loved ones. 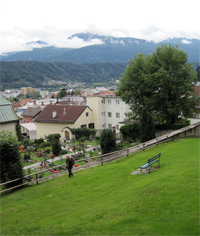 Walking out of the cemetery, through a stone gateway and up a curved street is a small green space with a magnificent and expansive view of Innsbruck. Several benches are placed here for the enjoyment of folks who have discovered this fine location. Looking below are the streets of Hötting and downtown Innsbruck can be seen not far away. Hötting is very pleasant, safe and quiet. It is a worthwhile place to explore, the quiet back alleys and narrow streets reveal farms and houses with gardens. Eating healthy foods can be a problem when traveling. Dealing with a different schedule, an unfamiliar language, and the lack of a kitchen means that most meals come in the form of a ready-made sandwich or dining out. Often, this food may not be prepared with the healthiest of ingredients. When I explore I deliberately seek out places that offer fresh food – and places recommended by locals. One great location for fresh food in Innsbruck, Austria, is the Markthalle. The Markthalle offers a place for farmers and small businesses to gather under one roof; it is a big warehouse packed with fresh food, colorful vegetables and fruits, recently harvested meats, freshly baked bread, decadent desserts and several places to grab a decent cup of coffee. The weekends are especially busy as both vendors and customers flock to the market. 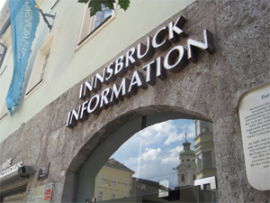 The Markthalle Innsbruck is just a block from Altstadt (Old Town), the heart of the city. The market is located next to the river close to the Innbrücke (Bridge over the Inn) and Market Square.